Boa murina Linnaeus 1758:215. Type locality: "America." Holotype: NHRM Lin. 9. Distribution and Habitat. The Green Anaconda is endemic to the Amazon Basin and some peripheral drainage systems in South America and closely associated with rivers and wet lands. Eunectes murinus is known from Colombia, Venezuela, Guyana, Suriname, French Guiana, Ecuador, Peru, Brazil, Bolivia and probably Paraguay. A population also exists on the continental island of Trinidad which is at the mouth of the Orinoco River and the northern edge of the range. On Trinidad it probably does not range much north of 10º39’N. The southern edge of the range was given by Henderson et al. (1995) as about 26ºS. However, there is an old record (Burton, 1869) at Maquine, Brazil which is about 30º40’S. The Common Anaconda uses aquatic habitats in tropical wet forests, tropical dry forests, and savanna at elevations below 240 m. The following comments are based primarily upon Dirksen (2002) unless otherwise noted. 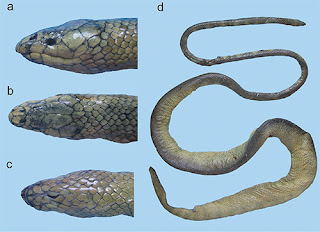 Both Dirksen (2002) and Giraudo and Scrocchi (2002) suggest that this snake is absent from Argentina, although there is a specimen reputedly from Orán, Salta, in the Museo de Ciencias Naturales de Salta. In Bolivia it is likely in most if not all of the river drainages that flow north into the Amazon. In Brazil it is widespread, occurring in virtually all of the states. It undoubtedly occurs throughout the Amazon Basin, the Atlantic drainage systems, and in the drainages of the Mato Grosso do Sul. Ferreira et al. (2002) report the microhabitat used by this species as a small stream passing through tropical humid “terra-firme” forest with trees reaching 40 m high. In Columbia it present in most of the Amazonian drainages, but appears absent from the northwestern portion of the country. In Ecuador it is present in the Amazonian portion of the country, including the Napo and Tiputini drainage systems that flow into the Amazon. In Guyana it has long been known in the Essequibo and Takatu drainages. McGinly (2008) suggests it is present in the coastal mangrove community which implies a level of tolerance to saltwater. In French Guyana the anaconda is known from the Maroni and Oyapock drainages systems, and is probably widespread. Dirksen (2002) reports it in many of the river systems that drain into the Caribbean. Its presence in Paraguay is based on a single specimen in the Field Museum collected by Karl Schmidt in 1926 and sighting by a variety of people. In Peru, it is again found in the Amazonian portion of the country, including the Ucayali, Marañon, and Madre de Dios drainages. In Suriname, murinus is widespread in the Caribbean drainages (Abuys, 2003; Dirksen, 2002) and with coastal sightings it seems likely it may be tolerant of brackish and salt water. On Trinidad this snake is restricted to a few lowland swamp areas such as Nariva Swamp, and it has colonized some flooded quarries in north central Trinidad (Murphy, 1997). It does not occur on Tobago. Boos (1984, 2001) describes it on vegetation mats at sea. In Venezuela, it is widespread in the Orinoco drainage system and is mostly likely found throughout out the country, there is the possibility of an isolated population in the Maracaibo basin (Barrio-Amorós and Manrique, 2007). The only well studied population of Green Anacondas is in the Venezuelan Llanos. The Llanos is a mosaic of savannas, rivers, flood plains, lagoons, palm forests, and gallery forests. Radio tracked snakes were found in the water 86% of the time, and at the water’s edge the other 14% of the times they were located (Rivas, 1999). Reed and Rodda (2009) produced a climate space diagram for this species which shows that it inhabits areas that have mean monthly temperatures between 29º and 13ºC. And, in areas that receive between 0.9 m and 1 m of rainfall per month, but they note that the presence of surface water is probably more important to this snake than rainfall.